Yi-Chuh Lu is one of the youngest Taiwanese pianist to be getting the world’s attention with his amazing piano skills and he has the awards to prove it! Yi-Chuh has won the Arthur Schnabel, Sendei, Bratislava, Maria Canals, and many more. Yi-Chuh Lu was born in Taiwan and at age five he began playing piano. He studied with Klaus Hellwig and Michael Krist at the University of the Arts Berlin. in 2006 he was awarded from the Vienna Cziffra Foundation for his outstanding achievements for performing the G. Cziffra Compositions. Yu-Chih Lu holds an Assistant Professorship at the National Taiwan University of the Arts. Yi-Chuh has twenty-three concertos memorized. We look forward to hearing him at PSU July 10th- Lincoln in the small theater in the basement at 3pm, this is a ticketed event. 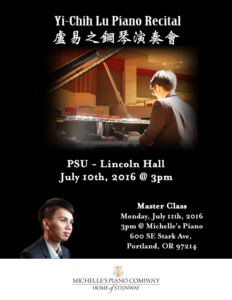 He will be giving a free master class here at Michele’s Piano on July 11th in the afternoon at 3pm. We will be working with both advanced and beginner students. 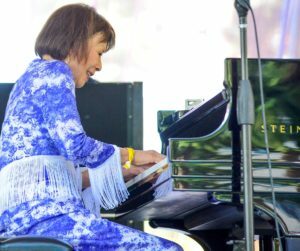 This Friday June 17th Michelle’s Pianos welcomes Toshiko Akiyoshi to the stage in our recital hall. We are partnering with the Bravo Northwest Concert Series in bringing this wonderful Jazz Legend and GRAMMY Nominated artist. But in fact, Michelle’s Piano is fast becoming a well liked venue for jazz, classical, piano studio recitals and other music performances. Michelle’s recital room is becoming a well known room due to its wonderful acoustic, low rental costs, and the ability to socialize afterwards. In fact, we have hosted some great performers of international and national fame. But the main reason that performers love to do their concerts here is due to the fact that they have a brand new 9′ Steinway on the stage. Randy Porter , Portland native & Steinway Artist, remarked that a lot of the jazz musicians really love the room but more importantly appreciate the beneficial relationship which builds greater community. Most venues have subpar instrument for their performance space. When you have the best piano in the world on your stage, the audience then gets to enjoy the best performance in the world. The other factor which makes Michelle’s desirable is the fact that their isn’t a restaurant and immense amount of background noise. Not to say, that the concert goer can participate in some nibbles and refreshments it is the best of both worlds- food, folks and fun so to speak. Check our website often for upcoming events, Costs are relatively low and the interaction between performer and audience is warm and inviting! 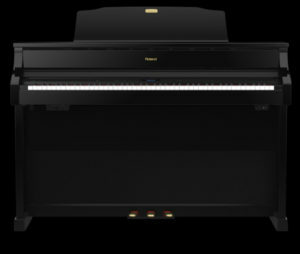 Steinway & Sons Spirio is the newest innovation. The Spirio is coming soon to Michelle’s Piano. This innovative high resolution player system married to Steinway & Sons a 163 year tradition piano company. It has been seventy years since Steinway had a player system called the Duo- Art player utilizing paper rolls. Same concept, except for holes cut into the paper, are now very highly defined 0′ and 1’s to deliver lifelike reproduction of the piano. Unlike other player systems, this one truly brings state of the art digital technology by allowing the nuances of pedaling and triple pianissimos and pressure sensitive action of the keys. Along, with the new technology, Steinway & Sons is ushering a new catalog of recordings from approximately 1700 Steinway Artist. From classical to rock, baroque to jazz and everything in-between the listener can have the intimacy of a private piano concert for their own enjoyment or to bring in world class artist perform for their parties. The system uses the simplicity of the iPad to hold the library, update and manage this unique playlist. Following on the success of last year’s piano competition here at Michelle’s Piano Company in November we are set to announce this years concert dates. Eligible piano students who are OMTA Syllabus level four and above are welcome to enter this years competition. The preliminary round is set for the weekend of November 4-6 with the final round set for Sunday November 13th. Our criteria is as follow repertoire may be from the Baroque period to twentieth century. Two pieces maybe selected and performed. They are not to exceed 20 minutes in total time. Each contestant is to be in concert attire. Portland Youth Philharmonic was established Valentine’s Day 1925. It is the oldest youth orchestra in the United States! Since its inception many young people have come to find their joy, passion and pursuit of music in the this world class orchestra. In fact each December, many of these alums come back and join the current youth orchestra for another whirl in the opulent Arlene Schnitzer Hall. What a joy to see many of our active seniors playing with the orchestra members of today and inspiring younger musicians for tomorrow. 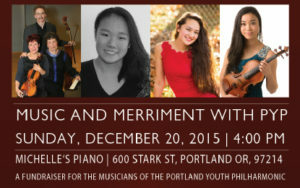 Join us here at Michelle’s Piano Company on December 20th 4-530pm as we listen to PYP’s three concert masters; Fumika Minuzo, Haeun Jung, and Halie Borror. The Florestan Trio will rounding out the afternoon, made up of Janet Guggenheim, Hamilton Cheifetz, and Carol Sindell. Incidentally, PYP will be honoring Carol Sindell as both a past PYP conductor, teacher of many PYP students and a strong proponent of the arts here in Portland. This music & merriment event is a both an awareness event as well as a fundraising opportunity to continue to seed the next generation of rising stars of musicians! Last weekend November 14 & 15 saw,forty eight students, representing nineteen studios, and playing for sixteen hours from intermediated to advance OMTA Syllabus X in our recital hall. All vying for two trips, an all expense paid trip to the famed Steinway Piano Factory in Astoria Queens New York. The two winners from the intermediate and advanced categories will be able to meet and have lunch with a Steinway executive as well as take in a musical event. The purpose of the competition is the promotion of the next generation of musicians. 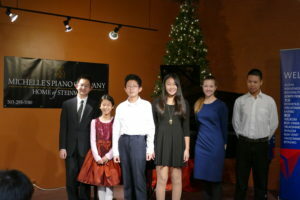 The competition criteria was relatively straight forward- students could perform anything from Baroque to 20th Century. We also encouraged students to perform a piece from as Asian composer! The top three finishers in each will also have the opportunity to use a Steinway grand piano in their home for forty-five days. This coming weekend eleven finalist will be try to see who will take the New York trip, cash and the use of a Steinway piano! 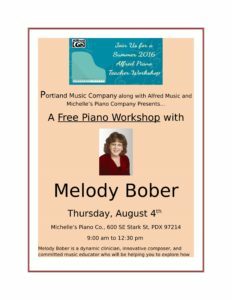 Sunday’s finals will be from 12-3pm with presentations by Portland Art and Cultural Center, Michelle’s Piano Company and Delta Airlines. All are welcomed to stay for the reception following the award’s ceremony. Ludwig van Beethoven (1770-1827) wrote 32 piano sonatas over the course of his adult life–the first when he was 25, the last at age 52, just five years before his death. Sometimes called the “New Testament” of the piano repertoire, collectively they represent one of the most significant achievements in the history of western music. Spanning nearly three decades, these masterworks chart the artistic and spiritual evolution of a man some see as the greatest composer of all time. Although we remember Beethoven chiefly for his compositions, he earned early fame as an electrifying and unorthodox pianist. Upon arriving in Vienna, it was the young virtuoso’s eloquence at the piano that most impressed the musical king-makers of his adopted home. For the rest of his career, the piano remained his favorite vehicle for self-expression, and the piano sonata became his compositional laboratory as he challenged the limitations of the genre and stretched the boundaries of music itself. After two centuries, the brilliant sonatas of Beethoven’s early years continue to delight, his “heroic” works still stun and inspire, and his profound final statements offer rich rewards through their depth and transcendent mysticism. The 22 sonatas chosen for this seven-recital series include those traditionally deemed the most satisfying and most historically significant. Hearing them performed chronologically allows listeners the unique experience of following Beethoven’s creative thought process as it unfolds through an illuminating, powerfully moving odyssey. 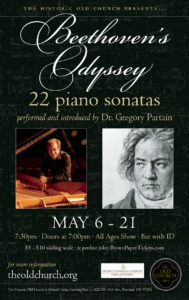 In his twenty-eight years on the concert stage, Camas, Washington native Gregory Partain has performed as piano recitalist, concerto soloist, and chamber music collaborator throughout the United States, as well as in Germany, Poland, Guatemala, Costa Rica, Russia, and Greece. He has garnered consistent critical acclaim in the U.S. and abroad for his live and CD recordings of a wide-ranging repertoire: “…some of the best Scarlatti I’ve ever heard…these approach the same level as Horowitz’s legendary recordings” (American Record Guide); “Gregory Partain is a gifted pianist, and every item is intelligently and sympathetically played” (BBC Music Magazine); “…brilliant clarity, crisp articulation, and a magnificent sense of pacing” (All Music Guide); “He is a sterling-silver player. He doesn’t glitter; he gleams. Suffice it to say that the thrill in the audience was very real” (Lexington Herald-Leader). Also a serious composer, Partain has focused in recent years on compositions for voice that explore spiritual themes. Major works include Requiem (a large-scale concert piece for chorus and orchestra) and Stabat mater dolorosa for a cappella chorus–both with traditional Latin texts–and “Come to the Garden in Spring,” a song cycle for soprano and piano based on spiritual love poems of Jalaluddin Rumi, the 13th-century Islamic mystic. Partain received his Bachelors degree in Piano Performance from the University of Washington and Masters and Doctoral degrees from The University of Texas at Austin as a Javits Fellowship recipient. Since 1991 he has taught at Transylvania University in Lexington, Kentucky, where he holds a Bingham Award for Excellence in Teaching. Robert Cutiietta, now Dean of Thornton School of Music at USC, wrote an insightful book called, “Raising Musical Kids.” The approach of the book was written from the vantage point of an educator of music teachers, parent, band director, and more importantly musician! The overarching theme of the book was music improves the culture of a community and we want our children to be playing music as adults in their 90’s. Digital pianos, are becoming a great option for families looking to engage their children and even themselves in learning the piano. With technology and more importantly learning the piano, technology increasingly plays a larger role! Roland’s family of instruments have the capability to be blue-tooth enabled thus linking it with the Apple device whether tablet or phone. 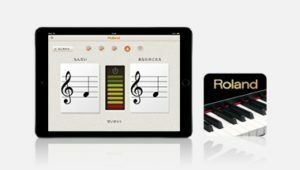 The free Roland, Piano Partner App, allows the beginner to learn notes either visually or aurally. A flash card or corresponding note is displayed or played for the student and then they find the corresponding note. They also can play a wide range of music and the Hanon/Czerny exercises along with both notation and track with. This capability also allows the student to change the tempo. This instrument increases the student’s ability to become more engaged with the music as well, reinforce practice time with lesson time, and connect them to the music for the long term. The digital piano has come a long way since the early days of the class piano. Touch and tone have been improved vastly. Digital pianos are modeled extensively after the concert grands. Roland uses digital recording of the New York Steinway Model D to capture the beauty and touch of the prestigious concert grands. Roland is the only manufacturer where one can put “dip weight” on their keys and the keys slowly drop similar as to the action of a grand piano. Why is this important? It provides a more responsive touch allowing for more expressiveness for the pianist. The tone of digital pianos have drastically improved. Most music professionals in hearing the recording of digital vs. acoustic are unable to differentiate the difference. One can make the correlation of that to digital photography. When the first digital cameras came out they were grainy at best but we were excited because we could take multiple pictures, silly picture, and perhaps photos we didn’t want anyone to see and we were not wasting paper in the process. Today’s 22 mega pixel camera are as clear, detailed and life like as their SLR counterparts. So, is the sound of digital pianos. Digital pianos get their sound through sampling. This is simply recording acoustic instruments taking the recording converting to algorithms plotting these points along a curve that resemble the natural frequency of the sound wave of an acoustic piano. Digital pianos provide more than just piano sounds. Digital pianos span the musical genre from the clavichord to electric piano sounds in pop soundtracks of today. When both young and older students alike can play music from rag time, well tempered clavichord, or with an accompanying rhythm this ability brings a greater sense of fun and enjoyment in the pursuit of learning music. Music is all around us and we simply must find the musical outlet for all of these budding musicians. So, come in and try for yourself this exciting, captivating and highly engaging instruments to tap the inner musician waiting to express yourself! 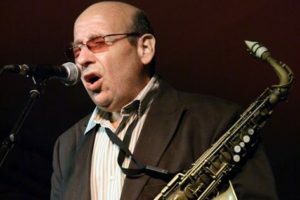 Master saxophonist/vocalist Bob Mover has been giving performances, lessons, and clinics world-wide for nearly fifty years and has performed with some of the biggest names in Jazz. His teaching method is transformative and provides students with the means to express themselves. Don’t miss this rare opportunity to study with with this Jazz master. At 8:00 pm he then will be joined by George Colligan for an incredible concert. Incidnetally, George will be releasing his new CD, here at Michelle’s on April 11th at 8 pm. 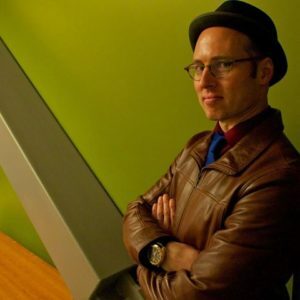 A jazz musician with an international reputation who has been working with names like Cassandra Wilson and Jack DeJohnette, PSU professor George Colligan is presenting two of his bands for one night of music in Portland. Theoretical Planets, a group in which Colligan plays drums, has released a CD on the Origin label entitled ” Risky Notion.” The CD has gotten rave reviews, including 4 stars in Downbeat Magazine. The group features Joe Manis and Nicole Glover on saxophones, and Jon Lakey on bass. It’s been described as one of Portland’s most exciting jazz groups.